Ken S. wrote: I'm confused already. It's only taken me three days, but I think I nailed it down. Where are you lost? I actually like the new system a lot. I only wish they'd print a quick-reference guide to the train numbers in the schedules. With the greater emphasis on train numbers now that the Rs are gone, some folks may actually want to know how to decode them. dcipjr wrote: I actually like the new system a lot. I only wish they'd print a quick-reference guide to the train numbers in the schedules. With the greater emphasis on train numbers now that the Rs are gone, some folks may actually want to know how to decode them. I think that might end up being too much information for the casual user. Better to focus on departure times and destinations, which most people know already. So, as an example, train #3596 originates at Media or Elwyn, and goes to Doylestown. Is this correct (I'm assuming West Trenton is out of the mix since the train must go through center city)? Can you tell if it originated in either Media or Elwyn? Also, I know this train goes to Doylestown because I ride it, but can I tell if it is a Landsdale or Doylestown train just by the number? 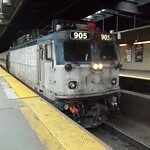 cahjis wrote: So, as an example, train #3596 originates at Media or Elwyn, and goes to Doylestown. Is this correct? Can you tell if it originated in either Media or Elwyn? Also, I know this train goes to Doylestown because I ride it, but can I tell if it is a Landsdale or Doylestown train just by the number? Nope. And they took away the numeric distinction between Bryn Mawr locals (0xx) and the rest of the Paoli line (5xx) too. I find it interesting that the new train numbering scheme will make it easier to track certain consists during the day, because you will now be able to know where each train came from and where it's going. Under the old scheme, a train headed to Fox Chase for example from maybe Wilmington would just have the 48xx designation on the Fox Chase schedule. i.e. you couldn't tell where the train originated from just the Fox Chase schedule, you would have to do some searching. Now, assuming they don't cut any cars anywhere throughout the day (not a valid assumption, but let's just say for the sake of argument), you can tell where each set of cars goes during the day. So all you 269 spotters, the new scheme seems to make your job a little easier... perhaps now you can predict where it will end up later in the day. It looks like Trains are now shown as originating at Temple University station with four digit "7xxx" numbers. Formerly, 7xxx series trains originated/terminated at Suburban Station. Previously trains originating or terminating at Temple were numbered 9xxx since they moved to or from Roberts; how are the 7xxx trains handled? Reversing at HUNT? ExCon90 wrote: Previously trains originating or terminating at Temple were numbered 9xxx since they moved to or from Roberts; how are the 7xxx trains handled? Reversing at HUNT? 7xxx trains under the current numbering scheme would be originating at Chestnut Hill East, deadheading from the yard there to Temple U. The second digit would be the line the train terminates on. Trains terminating at Temple that deadhead to CHE yard for midday storage would have x7xx series numbers. The Temple 7xxx trains are heading to Wilmington & Newark, and yep, they're are several with X7xx heading back.